Nakano Broadway was not a spot on my radar until I heard about it from Miette-chan of Otagamers. On the surface it looks to be a normal shopping strip, but deeper in and hidden away above the ground levels are the stores well-known in the nerd circles. 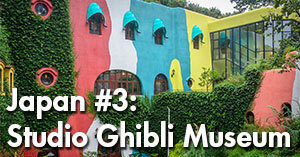 It is the home base of Mandarake, Tokyo’s second-hand hobby giant. 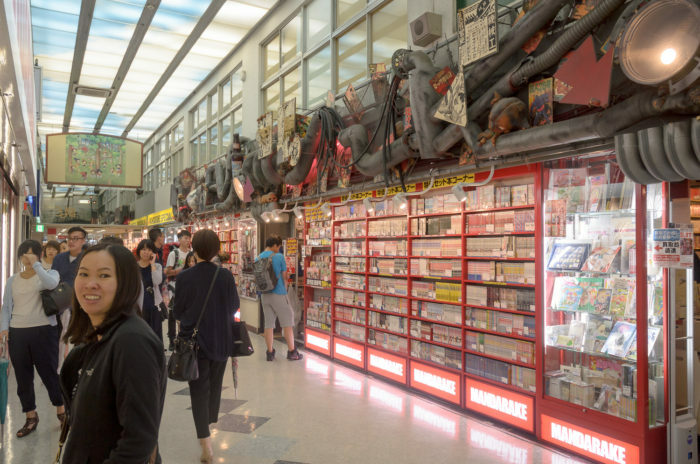 This chain has set up shop at many spots across the city, but the best thing about the Nakano Broadway locations is the layout — instead of a single store with everything crammed in it, the storefronts are divided by subject. This is great for several reasons. 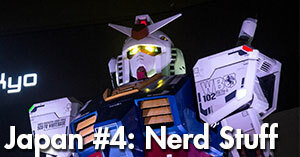 Each storefront was a gateway into a slice of fandom culture. 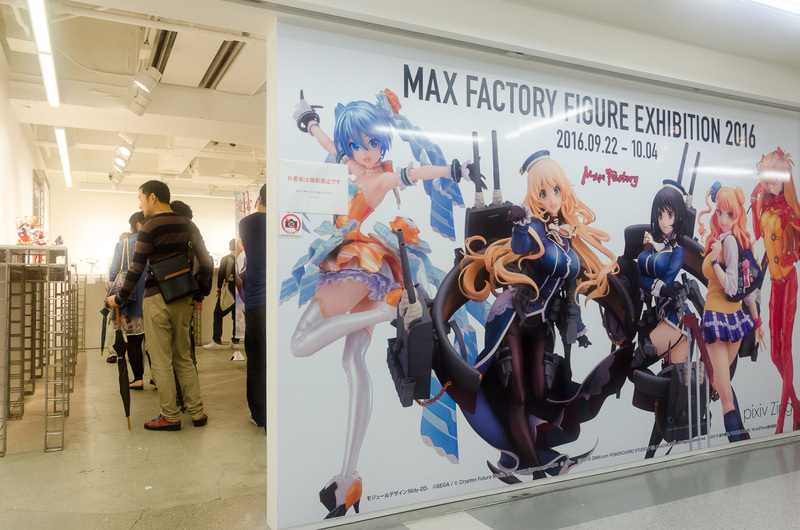 There’s the stuff that you would expect like PVC figures and doujinshi, but there are also separate storefronts dedicated to wrestling toys and car models. With stores dedicated to vintage robot toys and old magazines, these mandarake stores double as a museum of hobby memorabilia…a museum where you can take home the artifacts if you’re willing to cough up the dough. 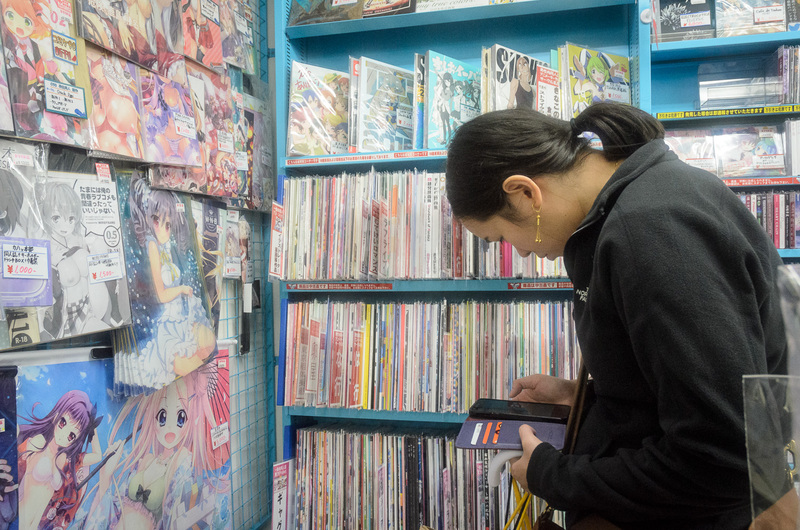 Though it may feel like it at times, Nakano Broadway is not all about Mandarake. There are plenty of other hobby stores in the area, selling similar things as Mandarake, as well as anything between Legos and Sylvan family toys. If you’ve had enough of the weeaboo stuff, there’s always the long shopping strip outside for the normal stuff and restaurants. As someone who is accustomed to the shopping malls of north america, Nakano Broadway was a comfortable experience. Even if the stores are cramped and packed to the brim, all the stores are under one roof, and there is a finite amount of stores that can be explored over the course of an afternoon. In retrospect, Nakano Broadway was the good place to prepare to the madness to come. 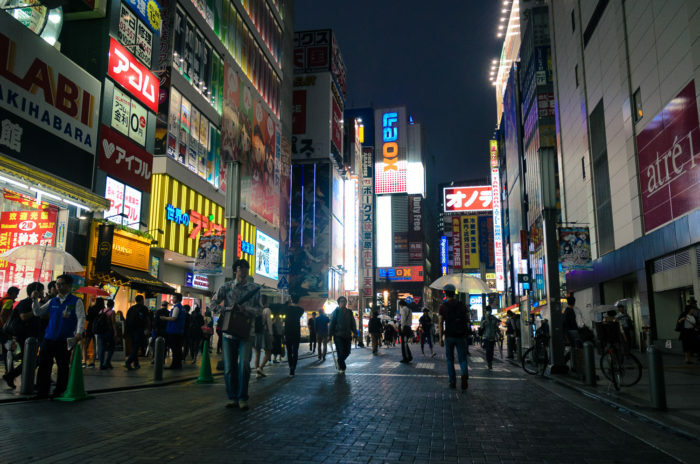 “Finite” is not a word that could be applied to Akihabara, the otaku holy land everyone knows all too well. 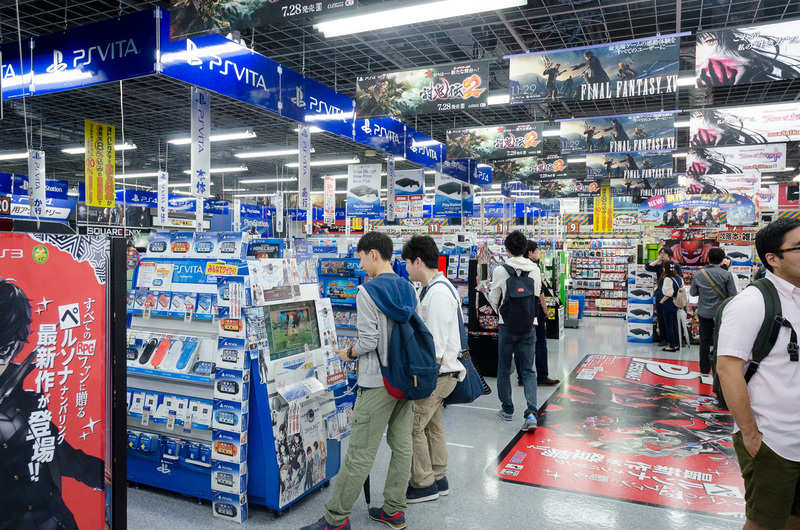 In an age where electronics retail stores struggle against online giants and arcades have all but gone extinct in north america, to see such a large district catering to these segments is a testament to Japan’s consumer culture. Amiami has a big physical storefront here, selling both new and pre-owned goods. 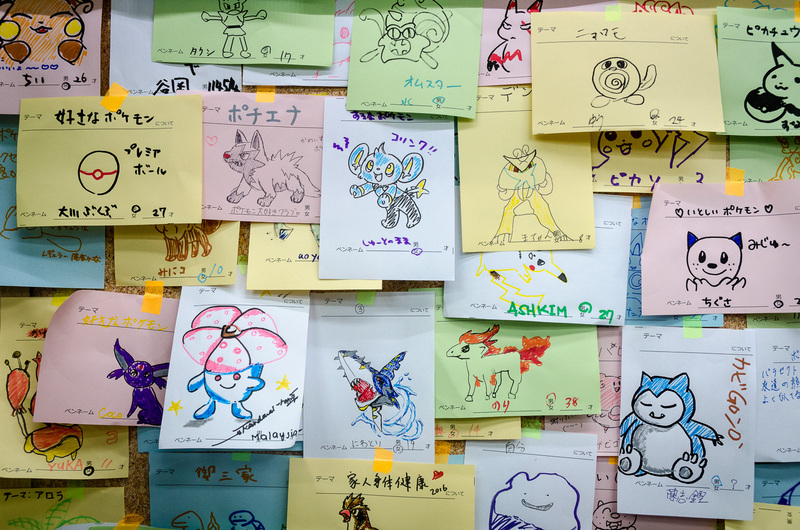 There’s also multiple Animates around the area. There was a lot to gawk at, and there’s nothing quite like being reminded of how expensive figures have gotten by finding yourself surrounded by boatsluts in the middle of Akihabara. It’s hard to not want to buy something from any of these stores — after all, wasting money is the central pillar of being a nerd in Akihabara. Thankfully, there is a well-stocked Mandarake branch here with some wonderfully helpful staff who helped me find some dojinshi to scratch my itch. 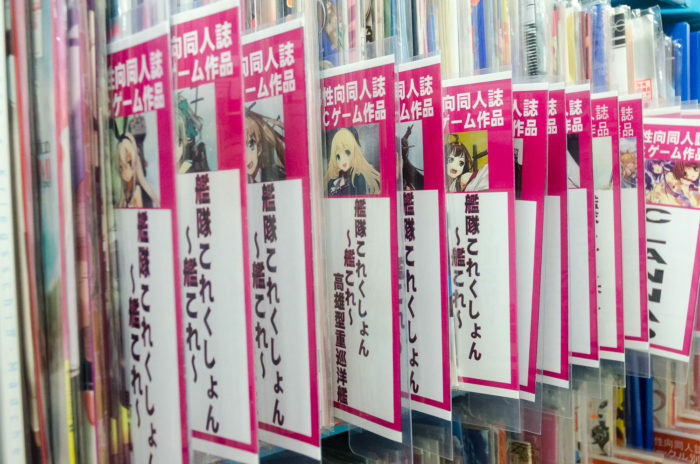 Incidentally, dojinshi are great — they don’t break the bank, don’t hog up much room in the suitcases, and unless you live in Japan, chances are you won’t find any stores around the block dedicated to pornographic cartoon parodies. If one prefers a more family-friendly flavour of shopping in Akihabara, there’s a Yodobashi Camera right on the main subway station. 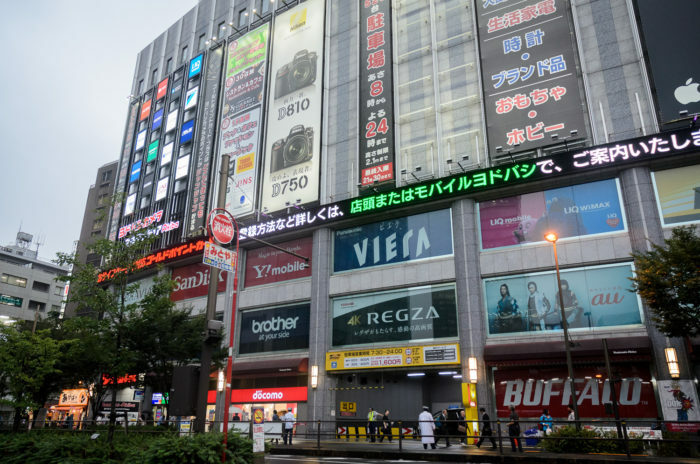 Although it may sound like a camera store, Yodobashi Camera really is more of general department store with a focus on electronics. The prices here on the photo equipment aren’t lower than that of the USA and Canada, and I was disappointed to find that even Japanese brand camera bags are more expensive here than they are across the pond. Still, all the latest and greatest gear were out on display, and even if you have no plans on buying anything, it’s still a great way to try out the gear you’ve always had on your wishlist. 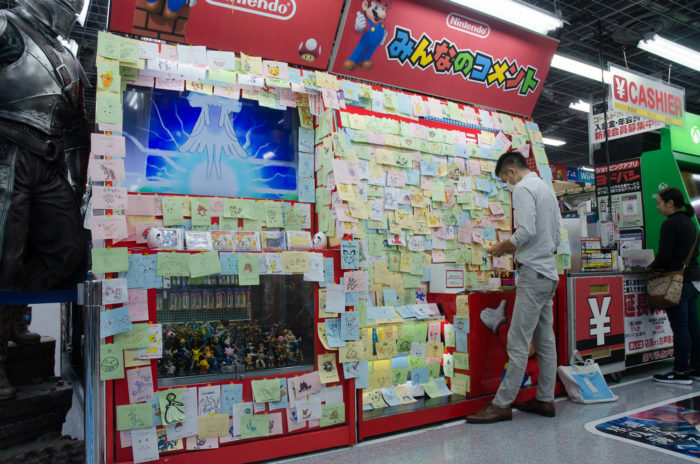 The top floor of Yodobashi camera is dedicated to video games and toys, and it’s a big floor. The expression of “as far as the eye can see” is appropriate here because it’s literally impossible to see the one end of the floor from the other. 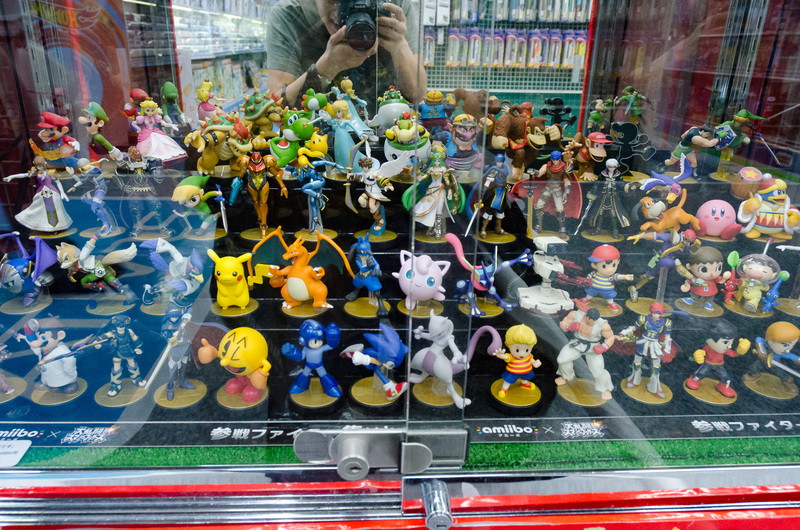 Unlike figure stores, I wasn’t nearly as familiar with the stuff on display, so it was great fun to explore. 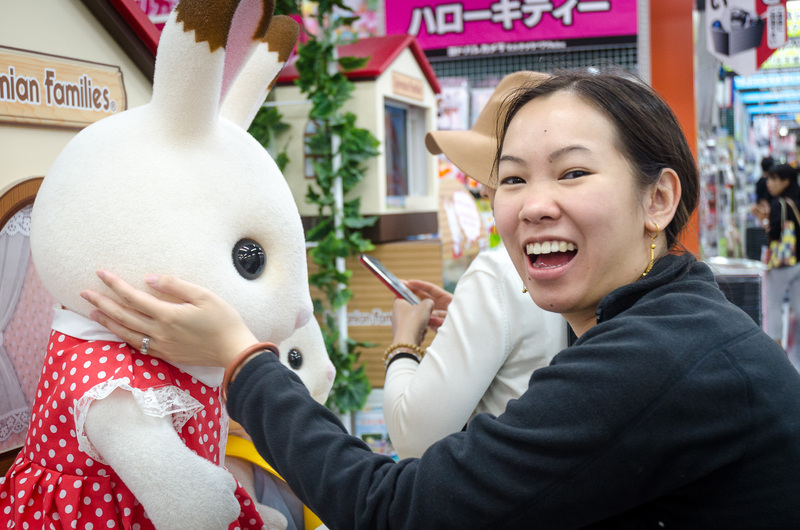 Likewise, the wife enjoyed immensely the well-stocked Sylvanian Families section and still gushes about it to this day. Of all the department stores we’ve visited in the city, this is by far the best & most relevant to our interests. Definitely should’ve spent more time here, and we will make a point to do so the next time we’re in Tokyo. 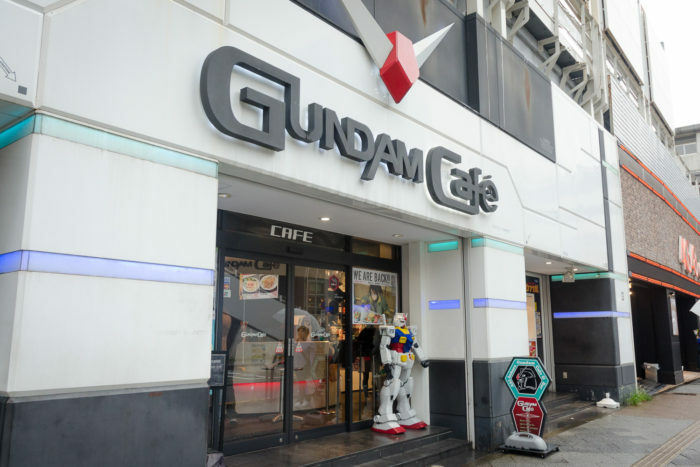 Close to Yodobashi camera is the Gundam Cafe. If you ever wanted to pay $12 USD for an elaborately decorated donut, you’ve come to the right place! 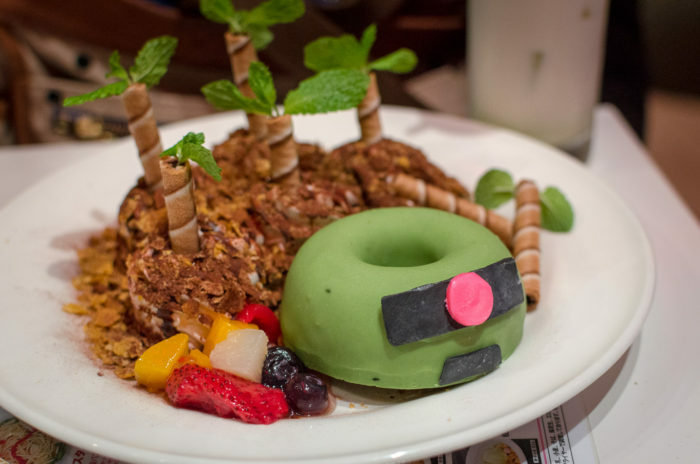 Seriously, the “desert ZAKU plate” was little more than a donut with a pile of whipped cream on the side. 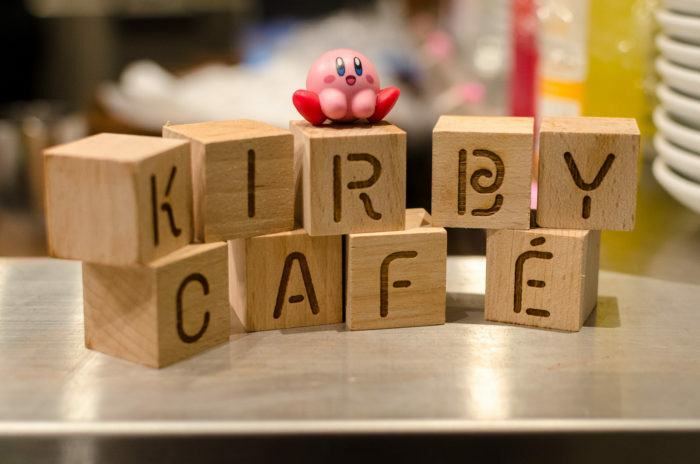 While I wasn’t expecting anything amazing from a theme cafe, it managed to undercut my expectations by quite a lot. 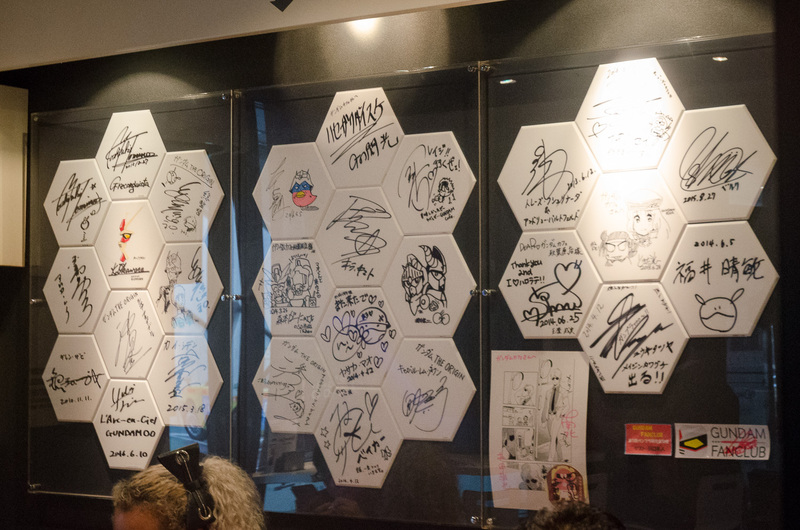 Besides the decor, a few plastic models and some autographs of gundam-related people, there’s not much to the cafe, and frankly it’s not enough to warrant the visit. Take a pass on this one. The claws have no strength. The only thing that comes from every attempt is a pathetic little flick towards your intended direction, which rarely moves the item at all. Repetition =/= success: even when it seems like the prize is moving, sometimes it’s simply being spun in place, giving off the illusion of progress, encouraging you dig deeper into your wallet. 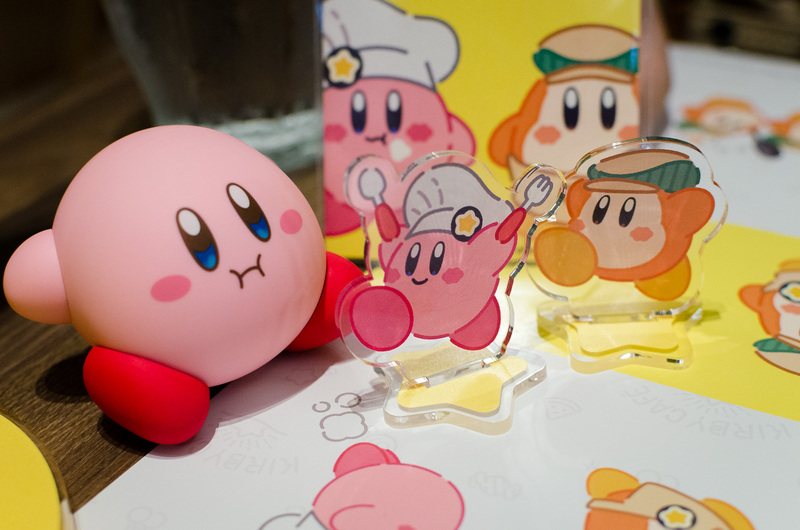 If you wanted a particular prize, just go buy it elsewhere — chances are it can be found at Mandarake for a small fraction of the the price you would’ve wasted on the crane games. We partook in the scam for the experience, not for the actual prizes. 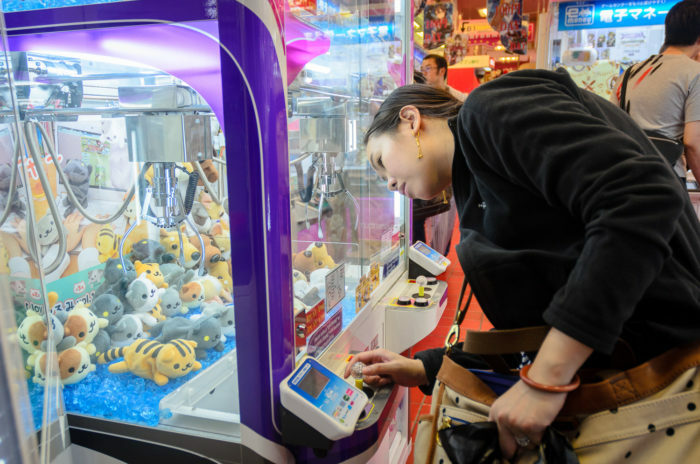 Yet even after multiple attempts across multiple machines, the experience of actually winning anything proved impossible to attain without wasting an appalling amount of money. 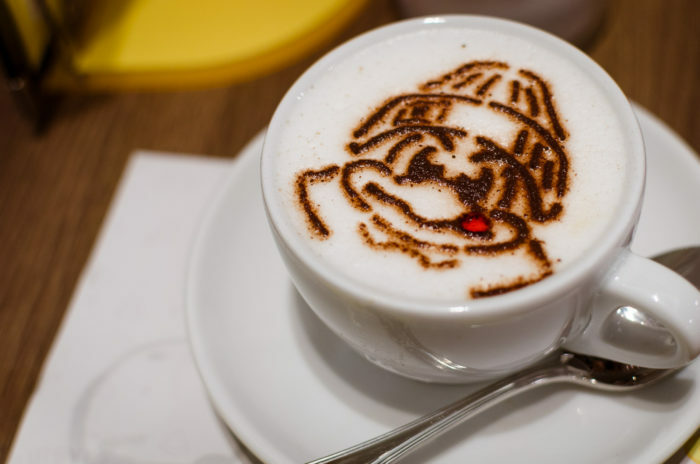 Just take my advice and avoid these at all cost — Japan is great at milking money from tourists, and this is by far its most poisonous appendage. 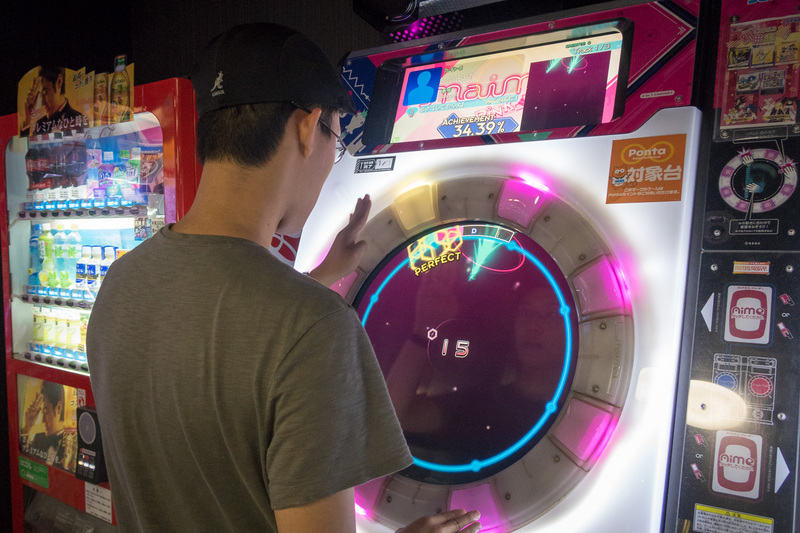 On a positive note, I was very impressed with the rhythm games — Taiko Drum Master and MaiMai (a round touchscreen-based game) both have songs from recent anime and NicoNicoDouga videos. I was surprised to find the Macross Delta opening theme (this is back when it was still airing). Looking back, I should’ve spent more time playing more real games instead of throwing money into the liar machines. 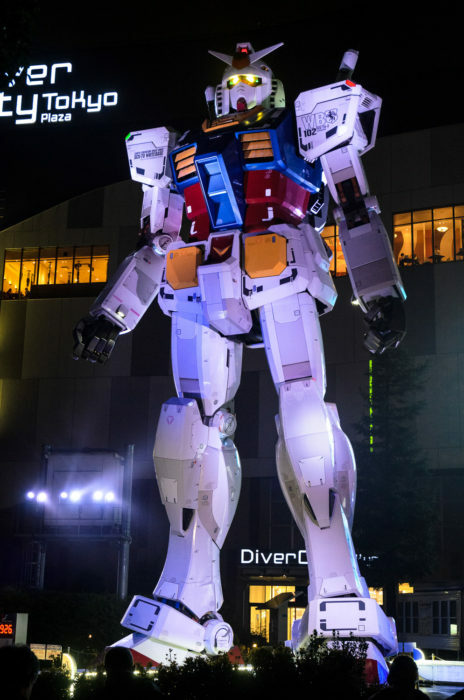 The 1/1 scale gundam needs little introduction, and it’s every bit as large as promised. We caught a special light show at 9:00pm when a trailer of Gundam Thunderbolt was projected onto the building behind the statue. I get the sense that not a lot of thought or effort was put into the light show, because most of the flashing lights during the show never reached above the statue’s knees! A less obvious reason to see the statue is to experience Odaiba. It is an artificial island reclaimed from the Tokyo bay, and the development on it is remarkably different from the other parts of the city. 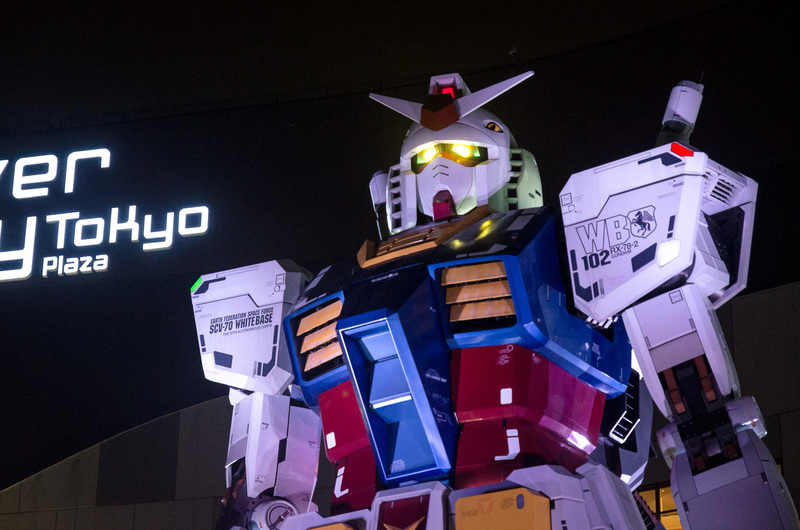 With wide open spaces, a large western-style shopping mall, Tokyo Big Sight, and an self-conducting train that crosses over the Tokyo bay, Odaiba is a new frontier of an old city, with all of its shiny bits on display. 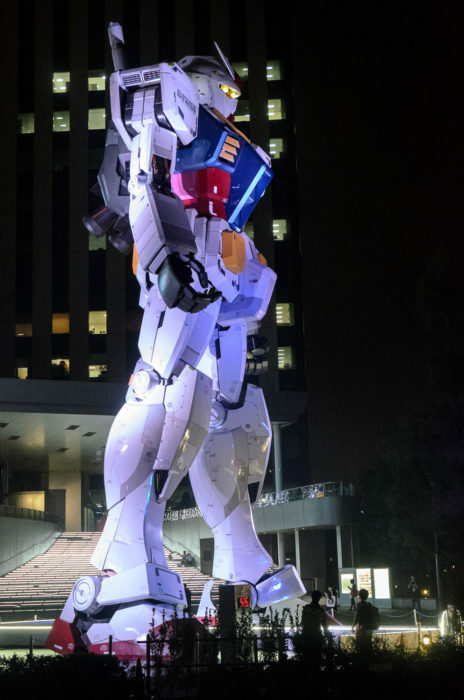 All in all, the gundam statue might not be worth a detour if you’re not a devotee of the franchise, but the surroundings would make Odaiba an enjoyable detour. 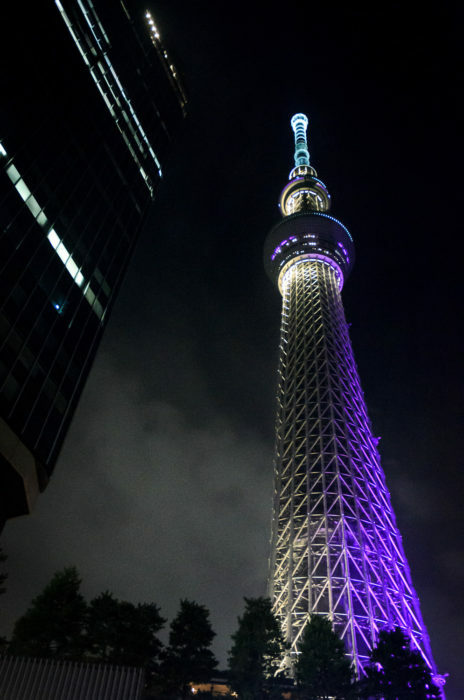 Speaking of new things, the recently erect giant phallic landmark Tokyo Skytree also has a brand-spanking new shopping mall built around its base. Thanks to fortuitous timing, our visit coincided with the limited time Kirby Cafe that opened up there. To my astonishment, when the food came, it was legit. 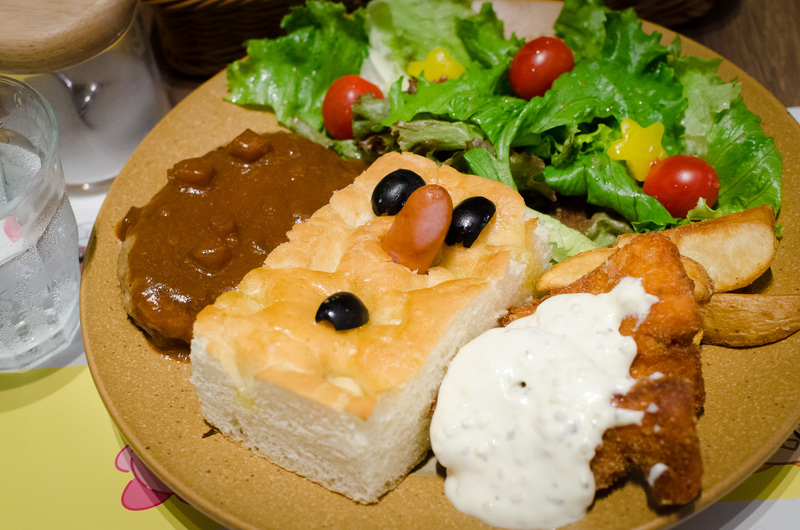 I had my Whispy Woods platter, which has a salisbury steak, fried fish and potato wedges alongside the vinaigrette salad foliage and bread tree trunk. 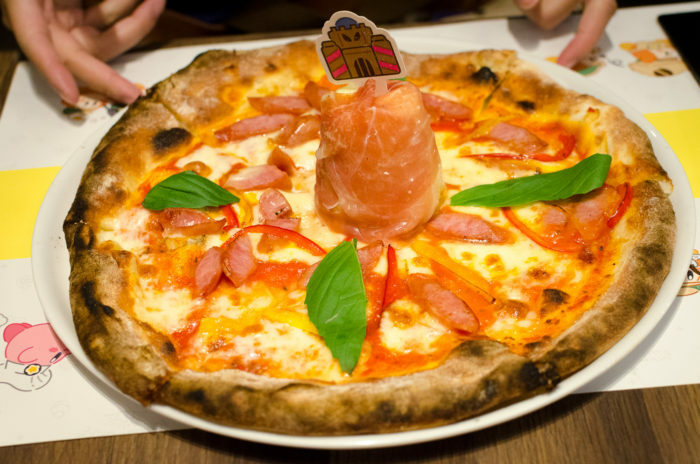 The wife had a Mount Dedede pizza, which has small mound of mashed potatoes wrapped in prosciutto on top of a stone oven-baked pizza. 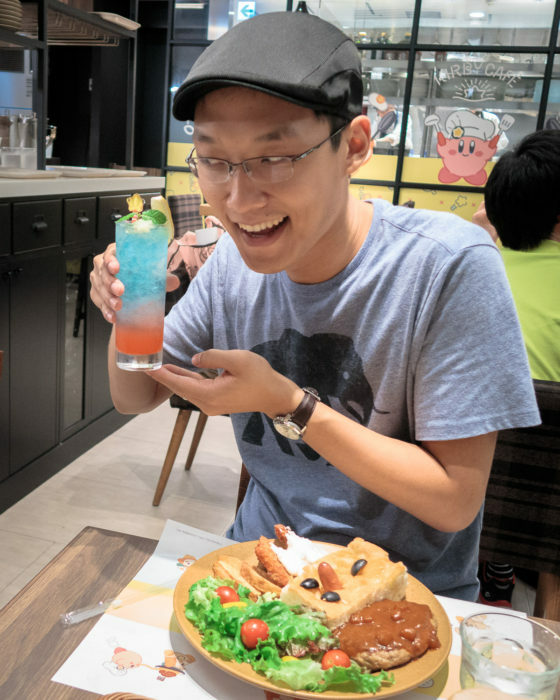 The food looked great and had the taste to match, which explains the long wait. Needless to say, the Kirby cafe blew the Gundam cafe far out of the water. Although I’d like to say that I had the most perfect time nerding out in Tokyo, in truth I was and am still a bit conflicted about it all. 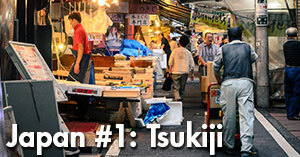 Honestly, despite my original lack of interest in shopping, looking around Nakano and Akihabara is fun. Even though you can find most of everything online these days, browsing around in brick & mortar stores gets you a closer look and lets you to handle the items beforehand. There’s also the possibility of finding something you weren’t even looking for in the first place. My main grievance about the experience really is more about Tokyo as a whole. The city’s obsession with shopping is often touted as tourist attractions, to a point where most of the city’s top spots are some variety of shopping district. 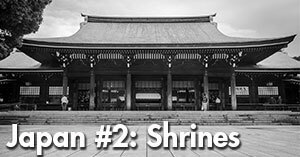 I’ll touch up on this in the last Japan post, but this has diminishing returns. By the time I was finished with Harajuku, Shibuya, Ginza, and Nakano Broadway, I was pretty much burnt out on shopping. If I could do it over again, I’d tell myself to read less tour guidebooks and use more common sense — if the idea of streets of clothing boutiques doesn’t sound interesting on paper, there’s very little reason to believe that opinion would change when you’re there, no matter how much of a “top sight” it is. Instead, follow your guts and spend more time at the places you think you’d enjoy, because you’re probably right. I’ve seen people talk about how used games in Akihabara have spiked in price once sellers figured out they could sell to chumps internationally, but I haven’t seen much appeal in shopping for games there, with most Japanese games being unreadable for me or incompatible with my region-locked stuff. 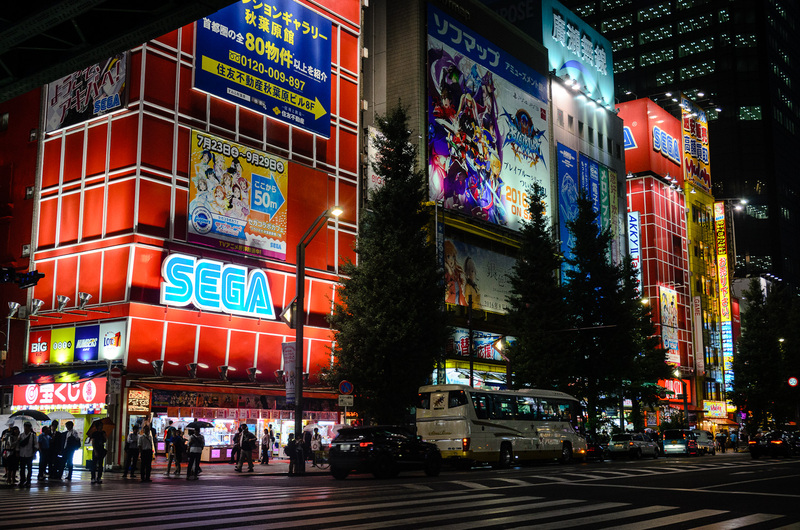 I still want to go to Akihabara and just absorb the atmosphere.